You can see the dullness and damage on this marble island top. 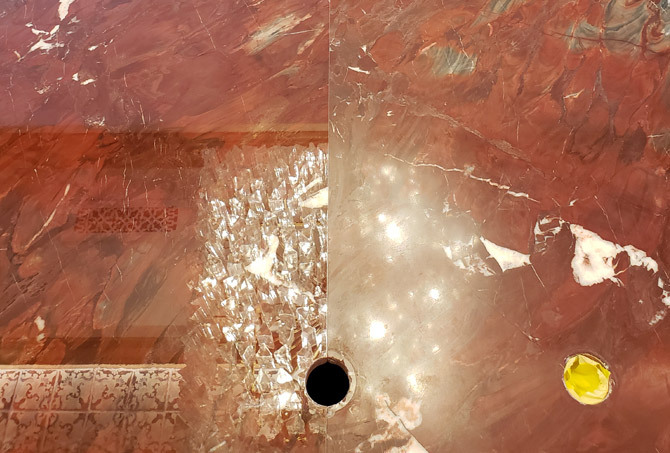 This close up image of the marble finish demonstrates the severe etching. This is the same marble island countertop after our restoration services and StoneGuard appliction. What a difference! The left side of the countertop has StoneGuard protection but the right side does not. See for yourself how StoneGuard dramatically increases the gloss. Here is another image demonstrating the difference StoneGuard makes to the appearance of the countertop. The upper left side of the countertop is finished. The rest of the marble still needs a StoneGuard application. Here is the other island top in the same kitchen, looking just as glorious as the first one. 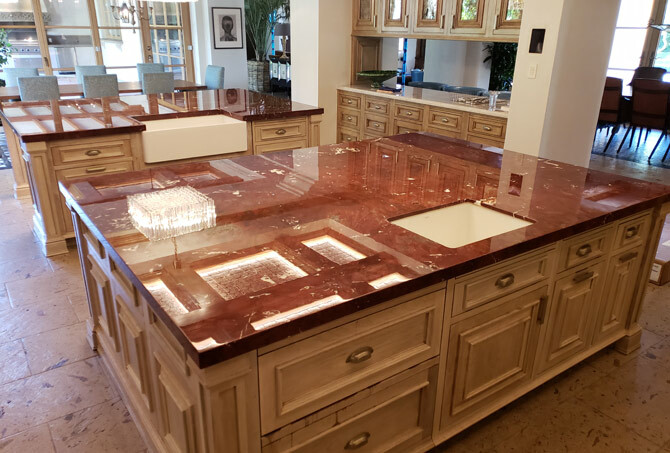 Homeowners in Paradise Valley, Arizona were frustrated with the appearance of the red marble island tops in their kitchen. 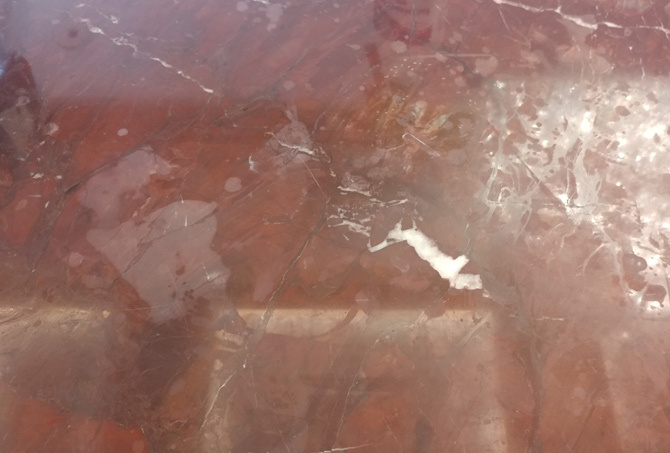 Despite using stone-safe cleaners and putting forth their best efforts to clean spills right away, the marble finish became etched and damaged. 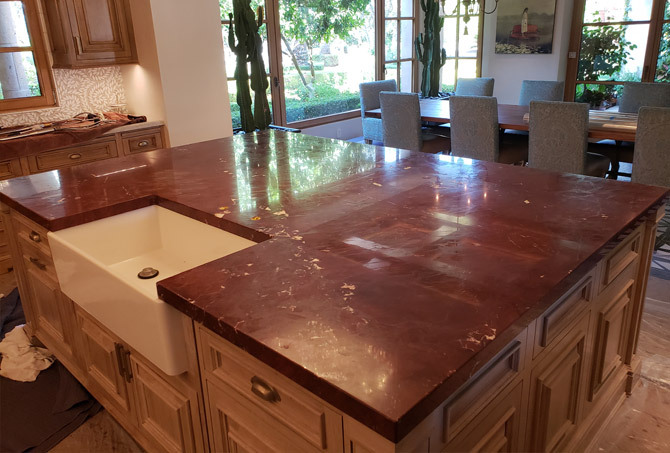 The homeowners knew that having their countertops restored would bring back the welcoming, clean, and elegant look the marble had when it was first installed, but their highest concern was protecting the finish so it stayed looking great all the time. 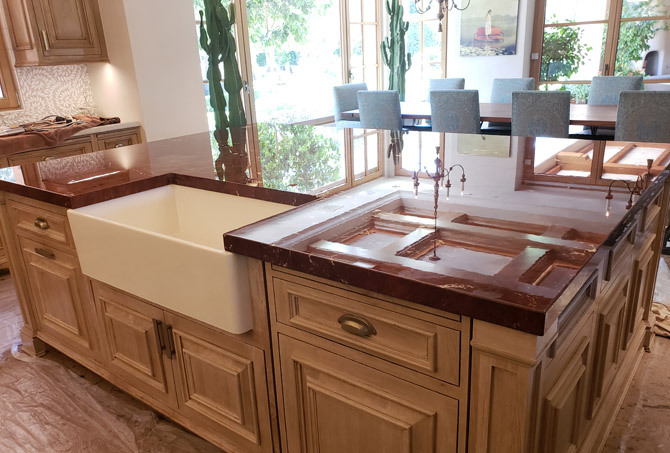 We proposed a long term solution: StoneGuard®, a protective polyethylene film applied to natural stone countertops that adds a new level of protection against etching and other damage. First, we honed the marble island tops to remove the surface damage and etching. 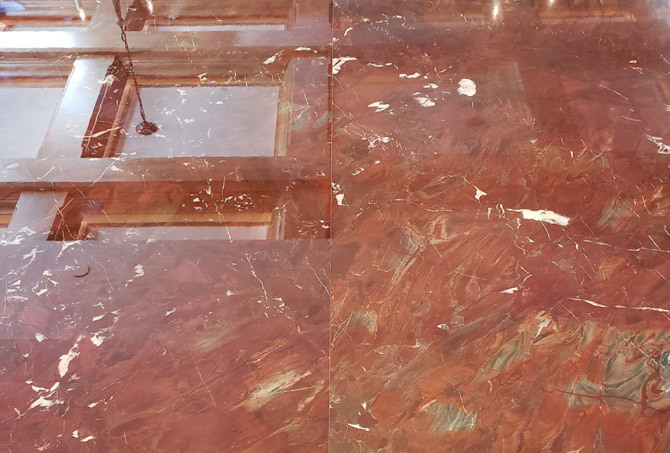 We used a clean microfiber towel, StoneGuard® Surfectant cleaner, and warm water to wipe down the marble surface to remove any residual dust and debris and then applied a priming agent to prepare the marble for the StoneGuard® application. After performing a quick test to check the bonding temperature of the marble surface, our highly trained technicians applied the StoneGuard® film with adhesives and a variety of tools. As they worked, they used special care to press out water and air pockets between the film and the marble. The homeowners were amazed at the results and so relieved that their island tops would be nearly impossible to etch for a long, long time. They loved the kitchen so much, they had us apply StoneGuard® to their wet bar black marble tops, as well. Read the Wet Bar Protected by StoneGuard® case study.